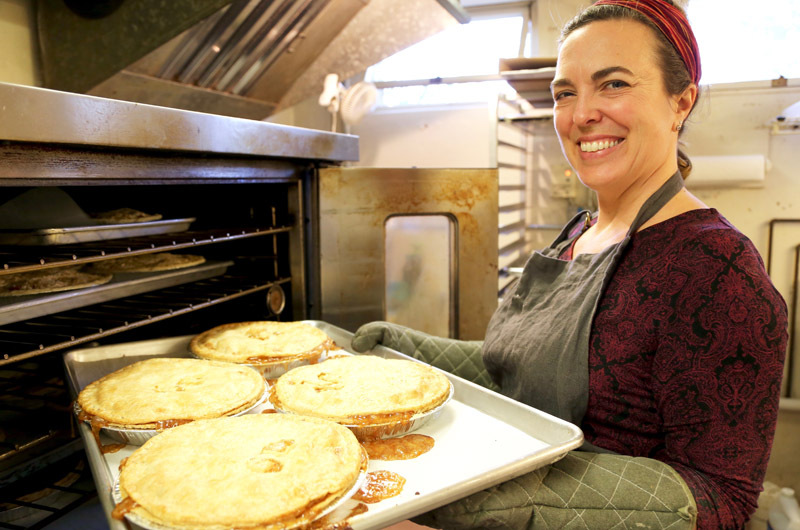 Christine Kinsman makes a 100 pies a day, seven days a week during the summer months. Christine Kinsman’s commercial kitchen is nestled in a sleepy, tree-lined neighborhood in Vineyard Haven. Through the kitchen’s glass door and windows, pine trees, blue sky and a fence are visible. There is also a wooden shed which holds four large freezers and one giant walk-in refrigerator. Chrissy, as everyone calls her, is the founder and owner of Pie Chicks. And pies, it turns out, need a lot of refrigeration. In her kitchen there are two more freezers and a reach-in refrigerator. During the summer Chrissy and her crew bake and sell over 100 pies a day, seven days a week. The demand slows in the off-season, especially after the holiday rush. Though Pie Chicks is plural in name, Chrissy is currently the only pie chick. Her kitchen manager, Raquel Ferrera, recently moved off-Island and she will not have enough business to hire a new crew until March. And although she is busy now with holiday orders, she is looking forward to a rest. Chrissy decorates each cherry crumb with a few snowmen that she snaps out of some pastry dough and then slips the pies into the oven. As she opens the oven door, a heavenly smell of all the pies — blueberry, apple-peach and pecan — wafts out. She takes a few graham cracker pie shells out to cool and then fetches some sour cream from the reach-in. She begins to make key lime pies, which she says consistently sell out. All this said, Chrissy did not set out in life to make pie. She was born in Avon Lake, Ohio, and went to Ohio State University, majoring in finance. From there she had what she called a “pantyhose business” job for two years. pist Sharon Strimling had offered her a position for the summer. Drew, who is a finish carpenter on the Island, was friends with Sharon’s then-husband Mick. He sat down and joined them for breakfast. They married in September of 2007 in the Friendship Garden at the Farm Institute and spent their honeymoon at a friend’s house on Chappaquiddick where they picked grapes and made jam. “We had so much fun that even when it was time for us to go back to work, we stayed for an extra week and commuted,” she recalls. spoons. Another wall subsists of clean up. There’s a small sink, which is the hand washing station and much larger commercial sink dedicated to clean up and accommodating large trays. A third wall is a long counter, which has spices, notes, and today serves as the pie prep and boxing station. The other wall has a small rack of stainless steel bowls and supplies. “I got so much of this stuff from Gates Rickard. He was really generous,” she says. She tells another part of her Vineyard story. 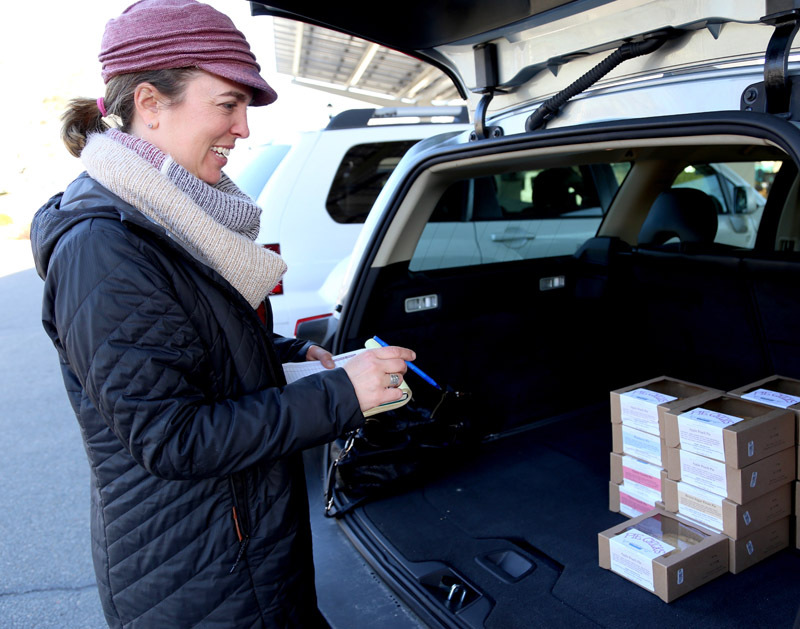 At the time, she was working as the business manager for the Farm Institute in Katama, but was tired of spread sheets, plus she had been there seven years. 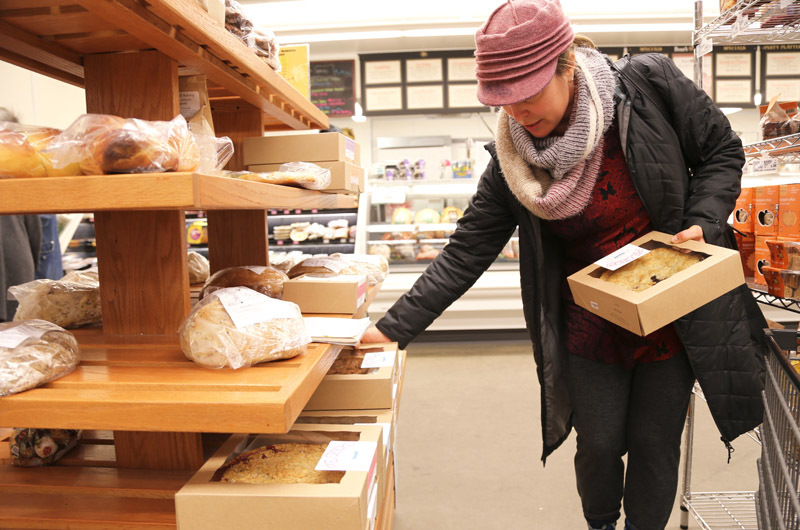 Her husband is friends with Bob Skydell, of Fiddlehead Farm, who was looking for pies to sell. She doesn’t follow anyone else’s recipes — except for the chocolate-covered macaroons, which are in her holiday cookie grab-bag. They are made using Judy Roger’s recipe from the Shiretown Inn. She says she tweaks things until she is happy with the results. And can consistently replicate them. She is also looking for alternatives to using palm shortening in her crust. The deforestation of tropical palm trees is depleting the natural food supply for orangutans, Sumatran rhinos and Sumatran elephants. “I’m going to try coconut oil and a few other things and see what I can come up with. Right action is very important to me,” she says. After all the pies come out of the oven, Chrissy packs up her Pie Chicks Volvo and drives the warm pies to Cronig’s. Pie Chicks pies are sold all over the Island, depending on the season, including the West Tisbury Farmers’ Market, Cronig’s, Tony’s, Edgartown Meat and Fish, Ghost Island Farm, Katama General Store, Rosewater, The Chilmark Store and 7a. Before driving away, Chrissy continues talking about her desire to connect with people through pie. This story made my day. 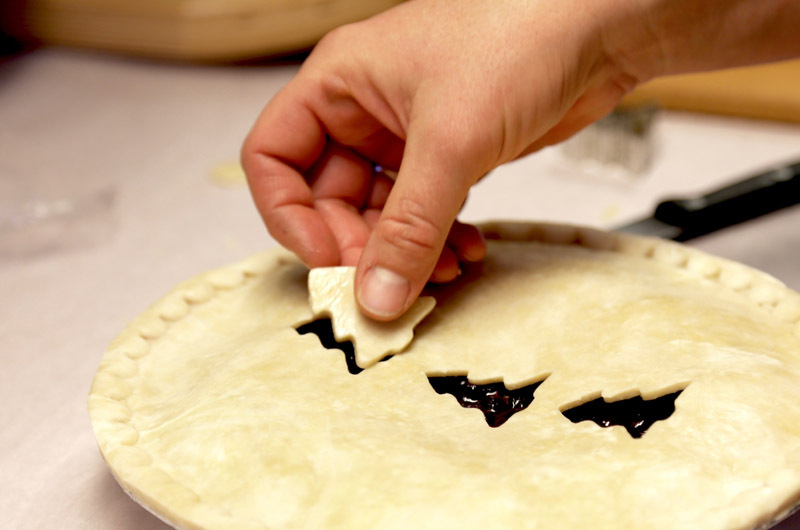 And now I want to go bake a pie! My daughter is heading back to island next week. Certainly going to ask her to bring back a pie! Best damn pie in the land! Eating an entire pie on a really hot day, while lying in bed naked...consider that on the bucket list! Pie Chicks pies are definitely the best on the island. And she makes Gluten Free which I need. Awesome article. Wonderful. Keep baking and listening to pie stories, Christine. Your story's a great one. I always buy a key lime pie for 4th of July weekend. My friends expect it and I am happy to serve it to them. We like to eat it frozen! Love, love the pies but the cookies are to die for. Pie Chicks makes the best cookies ever. Yum! Chrissy, your love, presence and grace abounds in everything you do. Step by step you continually create wonder from your wisdom. And nothing tastes more delicious than gifts from the heart. ❤May all beings be free - to laugh with loved ones around a table of Pie Chicks pies! Yummers. I will be visiting the island in February. After reading this great article, Pie Chicks is at the top of my list of places to visit. Sitting here, a long way from the Vineyard, we just finished our last bag of Pie Chicks Great Granola. Now we have to drive back to the Vineyard for more. Yum! It’s early morning and Tracey Olsen is sweeping up the tack room at Woodbe Farm in West Tisbury.